Eating Onion Benefits and Side Effects: As an aromatic vegetable, Onions are great for adding extra flavor to salads or almost every dishes. However, they really help us curing different illnesses and giving overall health benefits to our body. Onions powerful antibiotic and antiseptic properties contain the sulfur itself, which fight off free radicals and different chronic diseases. Onions make stronger our immune system, control blood sugar levels, lesser cholesterol, fight nausea, take care of arthritis, and maintain heart health. The local Americans are regularly used onions to take care of common colds, flu or a coughs, respiratory tract infection and illness. Along with having some health benefits, onions contain some other side effects, if it consumes in excessive quantity. 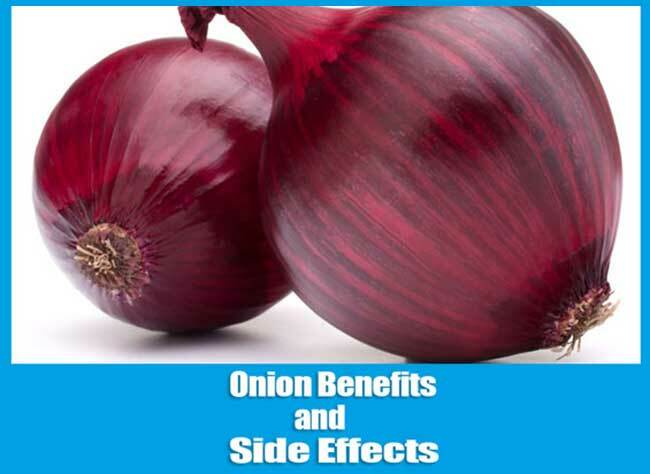 In this article, we will inform about eating onion benefits and side effects. Eating onions regularly is very helpful for diabetic patients. The low glycolic power of onion helps to control diabetes by releasing sugar into the bloodstream at a very slow speed, stops our blood sugar level from getting high, and therefore controls diabetes. Besides, the dietary fiber in onions also plays a vital role in controlling our blood sugar level and therefore helps control diabetes. Onion is infamous for making bad breath but they are useful to combat oral infections and tooth decay. It may sound strange, but according to studies, chewing red raw onion slices for 2 to 3 minutes can destroy germs of the oral area like gums, teeth, throat, and lips. Eating onions on a regular basis is helpful for the person with obese. Add some onions in your diet plan to lose some extra weight. Because the health benefits of eating onion are mainly for the low calorific value. Per 100 grams of onions contains only 40 calories; that means anybody eats onions without concerning about weight gain. Onions are helpful for decreasing the possibility of different cancers like colon cancer, skin cancer, breast cancer, prostate cancer, lung cancer, etc. Antioxidants present in onions like Vitamin C, E phytonutrients, phytochemicals, and flavonoids fight with the free radicals; stop them from causing oxidative damage to our healthy body cells. Make slice a medium size onion and take 1 tablespoon of brown sugar. Mix properly and let them cover for an hour. Eat this two times a day to throw away your cough. The sulfur in onions releases anti-bacterial properties that destroy cough-causing bacteria. It also works as a detoxifier to release our body’s blocked poison. Boil a medium size onion, mix with some water. Let them cool and apply as a pre-shampoo. The antimicrobial propensities of onions help to stop dandruff and to grow new hair. Besides, the oxidants help to stop hair loss, grow quicker and fuller. Take a medium size onion and 1 teaspoon of coconut oil together. Mix them well. Spread them on your chest and cover it using a towel. The natural antibiotic properties and the vapors in onion work as an expectorant and release the mucus in your chest that makes coughing. Onions can heal your ear infection as well. To get the best benefits of onions for the ear infection, take a finely chopped onion and cheesecloth together. Put chopped onion in the cotton. Keep it on the top of your ear. Continue it until the pain goes away. Make paste an onion and squeeze it using a cloth to collect the onion juice. Make some peppermint tea of your own. Drink 1 teaspoon of the onion juice, wait for a while. Then drink 1 teaspoon of peppermint tea. Continue this until you stop vomiting. It may be a newly painted room or a musty basement, or odors pair of shoes. Use a fresh onion to drive out the bad smell. Just place some sliced raw red onion in a shallow bowl. Keep them one corner of the room. See what happen? Onions can absorb the bacteria and viruses from the air to purify them. Lightly rub a fresh cut onion onto your burnt skin to stop the pain. The sulfur presents on onion will stop the infection, help to re-growth skin cell and will decrease the pain. Onions work well on fever like magic. Let see how- take a medium size thin sliced onion, some coconut oil, and a sock. Mix coconut oil and sliced onion properly. Place onion from top to bottom of your feet. Wrap them using a sock. The onion will pull out bacteria, toxins, and disease from the body overnight. Keep a sliced onion or 1 tsp of onion paste onto a bug bite place to calm it down. The anti-inflammatory properties of onion will lower pain and trouble from the insect bite. Make onion tea boiling a sliced onion and some water together. Let them cool and drain. Give 1 teaspoon of onion tea to your colic child every hour until they calm down. The powerful antibiotic properties of onion will relax muscles, strengthen the stomach, and control digestion. Eating too many onions can raise the possibility of allergic symptoms like redness of eyes, itchy skin, breathing trouble, oral bump, and tickly. Eating excessive onions may cause intestinal gas in our body. This side effect is mainly for having natural sugars like fructose in it. But, it is not a life threading side effect, however, sometimes it can result in nausea and diarrhea. According to the studies people who eat an excessive amount of onions, they fall into digestive problems like heartburn, and pregnant women are at a higher possibility of indigestion. Therefore, try to eat onions in moderately and pregnant women should eat onions only after consulting her doctor. One more major side effect of eating too many onions may conflict with blood-thinning drugs. Particularly green onions contain a high volume of Vitamin K which naturally helps in blood clotting, but this is the opposite of blood-thinning. Therefore, if it is needed to blood-thinning medicines like Coumadin then you should not take excessive onions. Eating too many onions may lower our blood pressure level, which may increase the possibility of fatigue, depression, faintness, nausea or blurred vision etc.